Personally, I’m a mini-PDA fan. I’ll hold Jessie’s hand in public, give hugs when desired, and small pecks on the cheeks or lips sparingly. As far as I’m concerned, that kind of stuff is small enough that no one will notice it anyway. It’s innocent, it’s quick and painless, and it doesn’t cause people to light their eyes on fire and run in the opposite direction screaming. However, you know how yesterday I told you about that whiskey pixie addicted to dancing? Well, sadly, she was also addicted to jumping in her boyfriend’s lap and eating his face off right. next to me. It was a sight to see, one that cannot be unseen, and I fully intend on going to a hypnotist to exile that memory from my brain, along with the concept of calories because that stuff is so depressing. Basically, when I wasn’t wishing for a root canal/drinking my way into oblivion/playing babysitter with this woman-child, I was being forced to watch her play tongue-cannibal with her boyfriend. I’ve seen some gross things in life, and this was easily one of them. I also felt incredibly hot with discomfort and embarrassment for them and for me, for being associated with them. I was hoping that if I called animal control, they’d swiftly arrive with their large nets and perhaps tranquilizer guns to control the rabid situation erupting before my eyes, but in the past animal control tends to be slow and my gag reflex was becoming increasingly more sensitive by the millisecond. I scooted my chair back further to be more of an observer rather than a close supporter of this intimate cannibalism, but unfortunately, in the spurts of making out-drinking and pawning off her whiskey onto me-and forcing me to dance with her, I was not left alone for longer than five minutes in which I’d began to think of ways to escape unharmed. …which brings me to my point: Having a boyfriend, girlfriend, husband, wife, lover, plaything or whatever else is wonderful. When they’re nice to you and you don’t want to rip their hair out, you want to kiss them and thank them for being awesome. However, doing so in public causes people to grimace, and usually when people grimace, it’s a sign that they’re boring judgey, angry holes into your back hoping you’ll find some seedy motel somewhere and finish your business elsewhere. Also, I’m pretty sure tranquilizing guns can probably be purchased on eBay or perhaps at some sporting goods store, so with their wide availability, it’s a good sign that one of these days, you won’t run into angry moms, disapproving old people, or passive-aggressive bloggers during your public romp, but some Jumanji-style hunter psycho who will dart your neck and steal your favorite board game. So, when in doubt, if it involves lap-sitting, face-eating, whiskey, or anyone else who isn’t you or your partner, may I suggest refraining from such activities until animal control arrives. In unrelated news, I made some popcorn. It tastes like Biscoff and has cookie pieces in it. Also, did I mention it has Biscoff and cookie pieces in it? Yep. Sweet, salty, & crunchy, it has all the textures & flavors you want in kettle corn without being too cloying. A big bowl of this during a show is sure to please–just uh, make sure the show in question doesn’t have cannibals in it. 1. Line a flat work space with wax paper. Meanwhile, in a microwaveable bowl, melt the white chocolate chips and the oil for 45 seconds. Stir, then heat for an additional 15 seconds until melted & smooth. Stir in the Biscoff spread to combine. 2. Pour the popcorn & crushed cookies into the bowl and coat thoroughly with the Biscoff mixture. 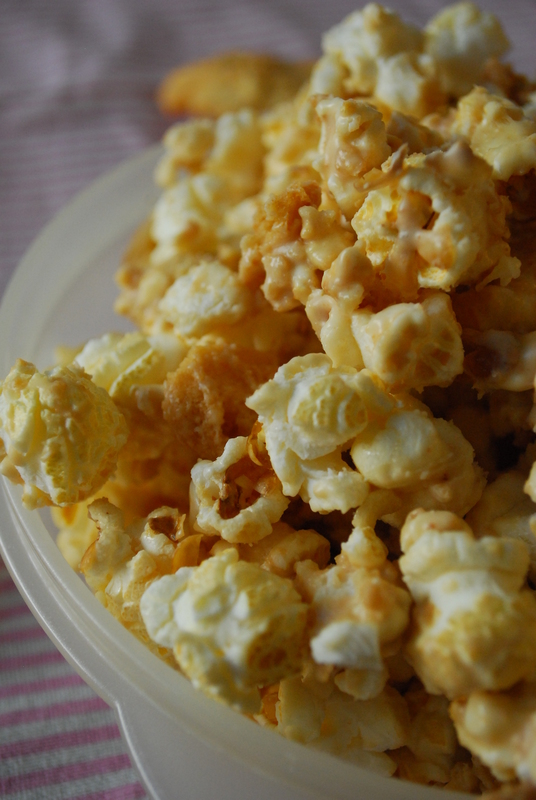 Spread the coated popcorn onto the wax paper in an even layer and let sit and harden for about an hour. 3. 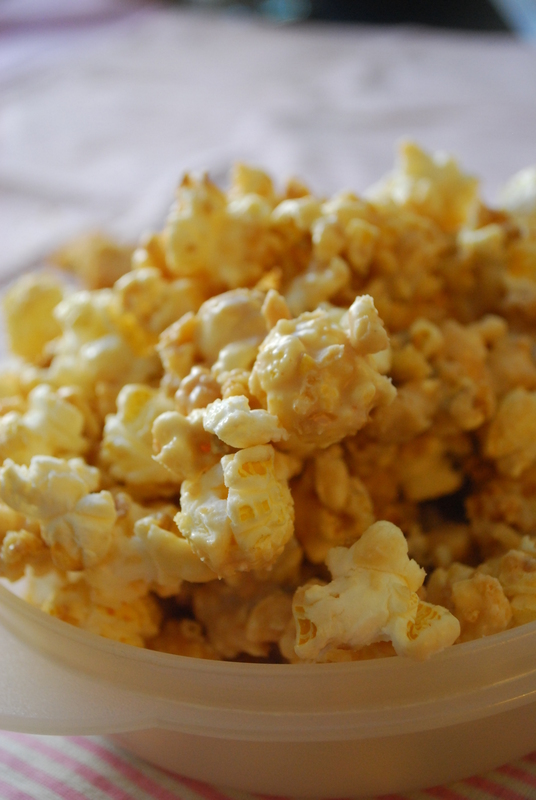 Break popcorn into pieces and store airtight at room temp for up to 5 days. We’re talking dangerously good here… but between public humiliation, rabid animals and flagrantly judging people, we all know I live dangerously. This popcorn is a mere accomplice to that. Yeah, not big on the folks who go crazy with PDA. It’s just not necessary. It’s like a train wreck, you can’t look away. I also can’t look away from this popcorn! I love the combination of the cookies, white chocolate and the Biscoff spread! Mmmm. 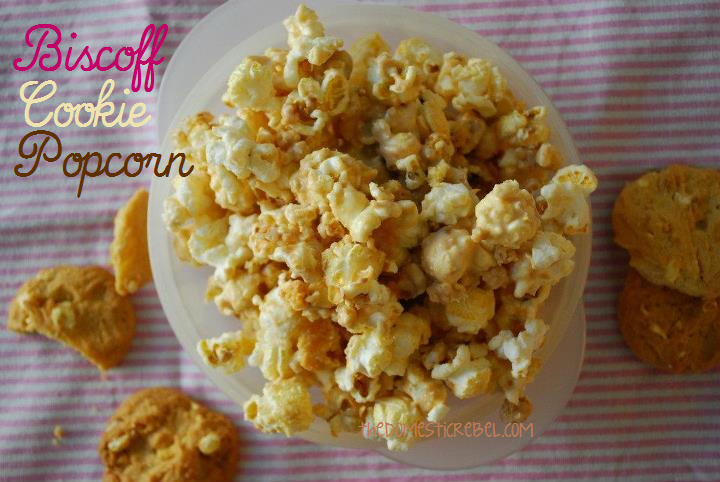 Huge popcorn fan and I love Biscoff or cookiebutter spread…so much! Lol we definitely should have a looksie–one of these days we’re bound to be identical twinsies. 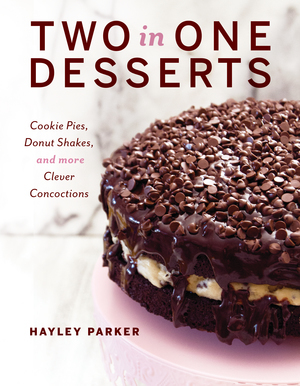 you and your biscoff, Hayley! I love it! Salty + sweet… you know I LOVE this. 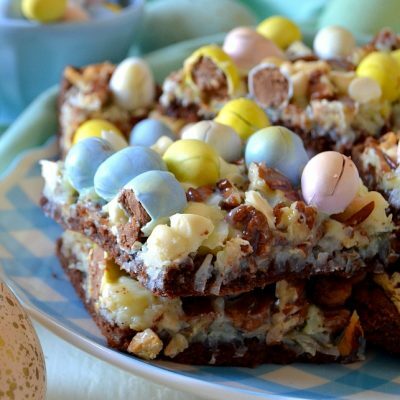 The cookie chunks are a sweet buttery surprise, too. I want kettle corn now. Must get to the store! What a great sweet treat! Eeek, we’re both in the Biscoff mindset today! Now that I finally got my hands on some, I can’t stop using it in stuff! 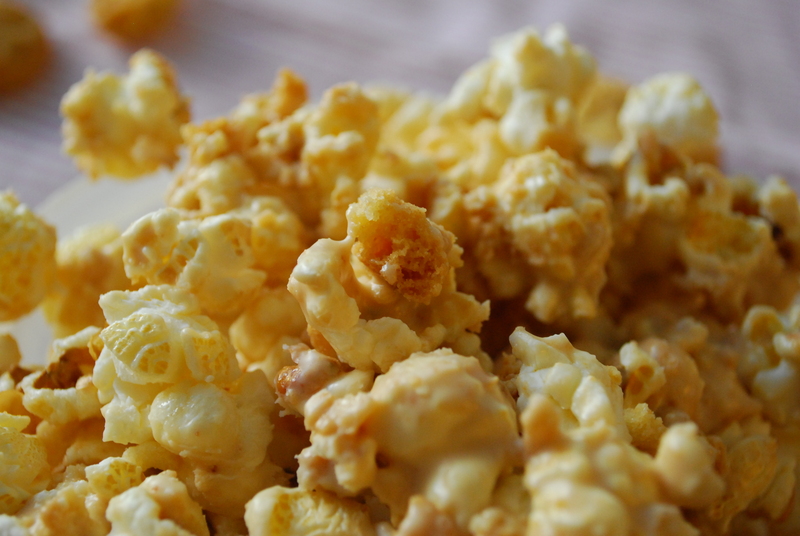 This popcorn mix looks amazing–and I LOVE that you used kettle korn to make it. Get in my mouth NOW! Great minds certainly do think alike, Ashley! I want that Biscoff puppy chow you made–it looks divine. Mm! Wow. This is some seriously amazing popcorn! Love everything about it! Yep, pretty sure I would love it, as I love BISCOFF. This is amazing!! you can’t get biscoff in the UK 🙁 despite it originating in europe! Miss Messy, that’s awful! I’ve heard UK friends say there’s lots of European-based products you can’t find in the UK, including Biscoff and SilPats. Hopefully you’ll start to see ’em around soon! That horrors of that night never end! Your poor eyes! I am totally with you on the PDA, ew. This popcorn sounds way yummy. Man, I really need to get my hands on some Biscoff!! This looks very dangerous. And dreamy. How big of a bag did you use? 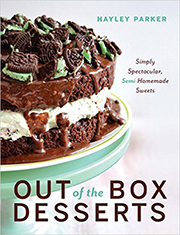 I’m dying to try this recipe!